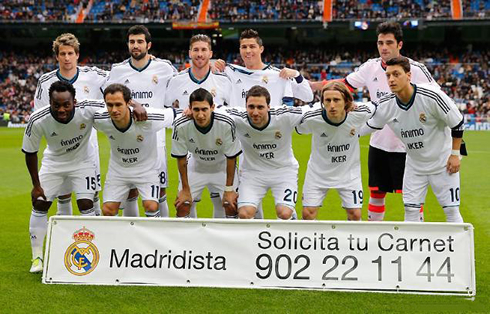 Real Madrid won the Spanish capital derby against Getafe by 4-0, in an unusual Sunday morning league fixture. Cristiano Ronaldo stole the show, bagging another hat-trick at the Santiago Bernabéu and showing he's ready for the heavy challenges the Merengues will have ahead, against the likes of Barcelona and Manchester United. Cristiano Ronaldo earned another standing ovation from the Santiago Bernabéu fans, as he carried Real Madrid on his shoulders once more, in a 4-0 win over Getafe. With a Real Madrid vs Barcelona scheduled for next Wednesday, José Mourinho rotated several key players in the starting line-up and even substituted Ronaldo after the win was secured, when there were roughly 15 minutes left to be played. Getafe showed a solid defense throughout most of the game, but Sergio Ramos controversial goal in the 53rd minute collapsed the visitors' side game strategy and focus, allowing for Cristiano Ronaldo to leave his mark afterwards, with a perfect hat-trick scored in less than 10 minutes. 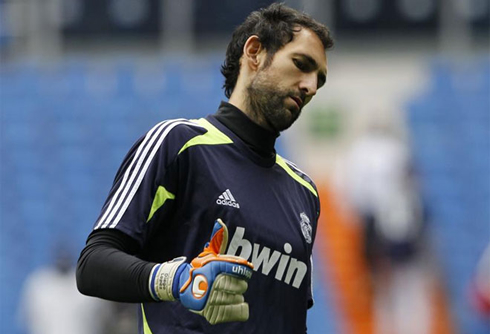 Adán ended up being José Mourinho's choice as the starting goalkeeper (Diego López didn't play) and passed this first test without compromising in any situation. In 3 days from now, he'll have his most important exam as a Real Madrid player, in the Real Madrid v Barça "Clasico" at the Santiago Bernabéu, for the Spanish Copa del Rey 1st leg. The first half ended goalless, as Getafe succesfully held on to what had been so far a highly moralizing draw. With Xabi Alonso and Sami Khedira resting for the mid-week game against Barcelona, José Mourinho placed Luka Modric side by side with Essien, hoping that the team's dynamic wouldn't be much affected. However, things didn't go as smoothly as the manager surely expected and Getafe's defensive efforts paid off over the first 45 minutes, as both times went to the locker rooms with the game score still at 0-0. With 7 minutes played in the second half, Real Madrid had at their disposal a great opportunity to score, but Fábio Coentrão's rebound shot was brilliantly stopped by Moyá and ended up resulting in a corner for the home side. Mesut Ozil put in a cross into the second post which Ricardo Carvalho jumped high to meet, in hopes of anticipating Getafe's goalkeeper. The Portuguese defender didn't manage to head the ball and ended up fouling Moyá on his arm, an action that the referee didn't seem to have spotted properly. As a result, the ball fell near Sergio Ramos zone and the Merengues captain easily pushed it into the back of the net, to make it 1-0 for the Spanish champions. With more or less controversy, there's a player in Real Madrid who doesn't miss a chance to steal the show when an opportunity comes on... Cristiano Ronaldo scored his first goal in this game on the 62nd minute, from one of those blazing counter-attacks that only the Merengues are capable of producing these days... Ricardo Carvalho picked the ball right in front of Real Madrid's penalty area and quickly found Mesut Ozil escaping on the left, with a low and strong pass. The German midfielder ran with the ball a few meters ahead, as he waited for Cristiano Ronaldo to overlap on the left, before leaving him the ball in a perfectly timed manner. The Portuguese forward struck the ball hard with his left foot and made it go past Moyá, granting a more comfortable lead to the Merengues. There would still be time for another goal though, but this time, from the penalty kick spot. Getafe's center defender, Lopo, fouled Luka Modric inside the penalty area and the referee didn't hesitate to point to the spot. As usual, Cristiano Ronaldo assumed the responsability and converted it into the 4th goal for the Merengues and also his fourth hat-trick of the season. The Portuguese striker is absolutely on fire in 2013, with 10 goals scored out of 6 games played so far. Right after Ronaldo's goal, Mourinho decided to take him off the field for Karim Benzema, and the former Manchester United player felt the love from the Santiago Bernabéu, as the entire stadium applauded him and chanted his name on his way out. There could hardly be a better time for Ronaldo to face the mighty Barcelona and even though the Merengues are still struggling to put on a consistent back four, there are certainly good reasons for the Madridismo to hope that their main star will rise up to the occasion next Wednesday. 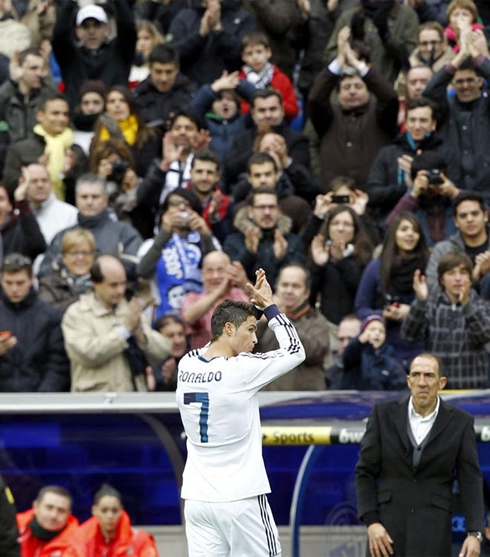 Cristiano Ronaldo next game for Real Madrid will be against Barcelona, for the Spanish Copa del Rey, on January 30, 2013. You can watch Juventus live stream, Real Madrid vs Barcelona, QPR vs Manchester City and Arsenal vs Liverpool, all matches provided from our soccer live section.